Need to split my classroom Apple TV to two identical TV's. Is this my solution? BEST ANSWER: We use it to split mac output to two HDMI projectors, don't see any reason this shouldn't work to two identical TV's. It has worked for me in 3 separate installations to split DirecTV to 2 independent televisions. It is all of your connections are HDMI. Yes. This should do the trick. Can I use just one output? I want to use it only as a upscaler. Android box to blackbird to 4k tv. BEST ANSWER: Most 4k TVs upscale on their own. If yours does you should not need this product. If the TV does not upscale then this should work. 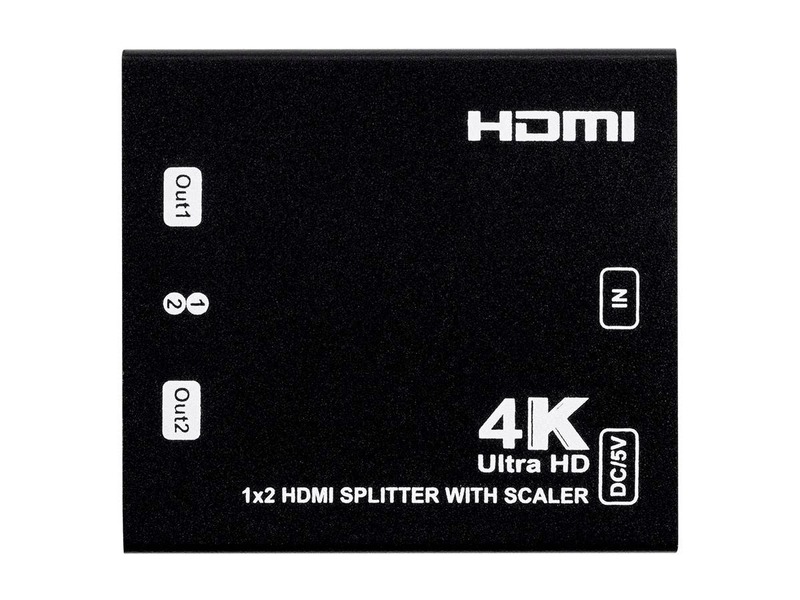 Can I use this to split a 4K signal from Xbox One S and run a video signal to the TV and audio to an older receiver to maintain original audio, like Dolby HD Master? BEST ANSWER: Thank you for your question. This unit would only upscale to 4K, it would only accept up to 1080p on the input. Using a splitter like PID 21612 would be best. 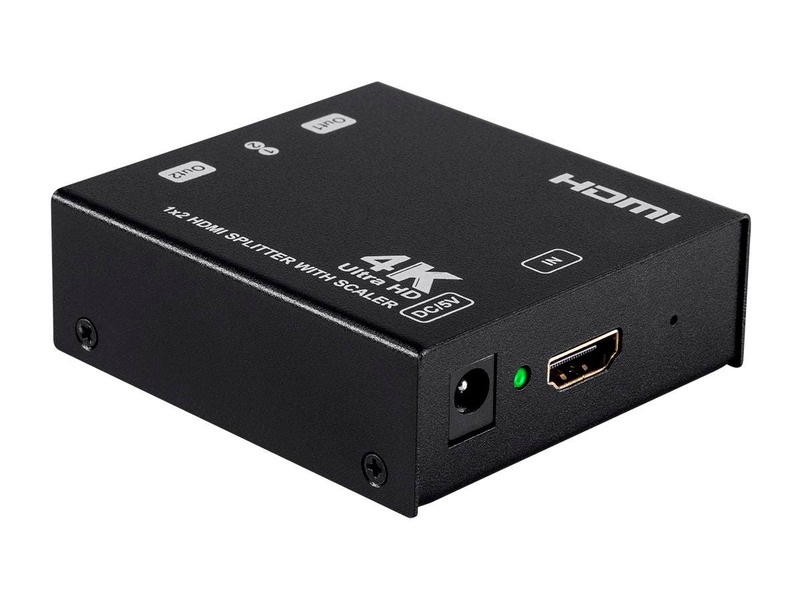 However, keep in mind it is best to use an HDMI audio extractor for setups like you are trying to achieve. Reason being is the splitter may choose the common resolution that the TV and receiver support thus outputting 1080p to the TV if that is what your receiver supports. Is this 2.0 certified? 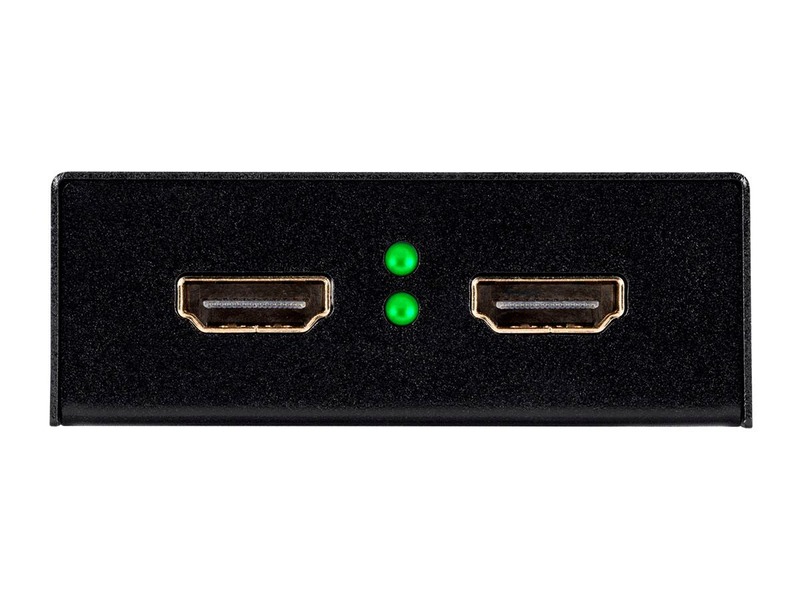 Able to be used with the newest standard hdcp 2.2? BEST ANSWER: Hello, thank you for your question. 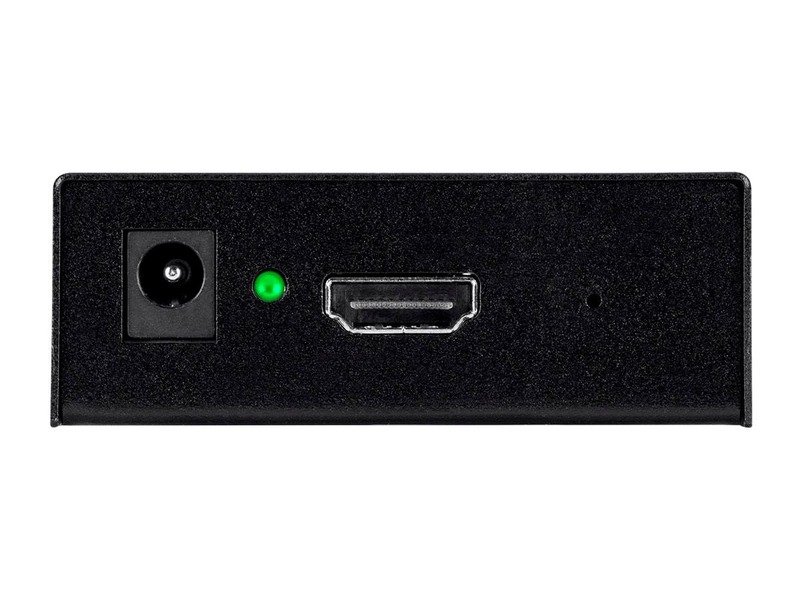 While this unit is not certified, it is HDMI 2.0 compatible as well as have HDCP 2.2 support. I hope this helps, and of course if you have any more questions feel free to contact us! Will this pass through IR?? BEST ANSWER: No it’s a straight pass through device it has no ability to send or receive any type of wireless signal. Why is this product warranty only for 1 month? Warranty info not stated anywhere. Ours failed the return/replacement link does not let me choose product for replacement grayed out. Do I have a paper weight now? BEST ANSWER: This unit will have a 1 year warranty. It has a 30 day return policy. If you attempted to refund it, the option to refund would be grayed out. If it has been replaced before it would then have replacement grayed out but that would just mean that you would have to reach out to us and we can set it up for replacement. can this device do 1080p @60hz to 4k @60hz resolution up scale? This device would only output 4k at 30Hz. With my old splitter the channel 1 tv would cut out if the channel 2 tv was turned on or off. There is no lag with this one. We needed to split the HDMI to two screens, and it worked just great, delivery was prompt and transaction was easy.Thanks! It was working great, but failed right after the 30 day warranty. Now I have a very expensive paper weight. So disappointed. Hello, thank you for your review. We do warrant this item with a 1 year warranty, so if you are still within that we can replace it. Please let me know if you do, thank you! I needed it to allow feeding to two separate TV's. One a 75 inch Sony UHD and the other a small Sony ND. It would not feed the large Sony without it continuously shutting the video on and off no matter how I connected it. I am a retired electronic design engineer and regularly connect AV systems so generally know what is wrong and how to correct. Not in this case. CONS: Could not get it to work no matte how I tried. 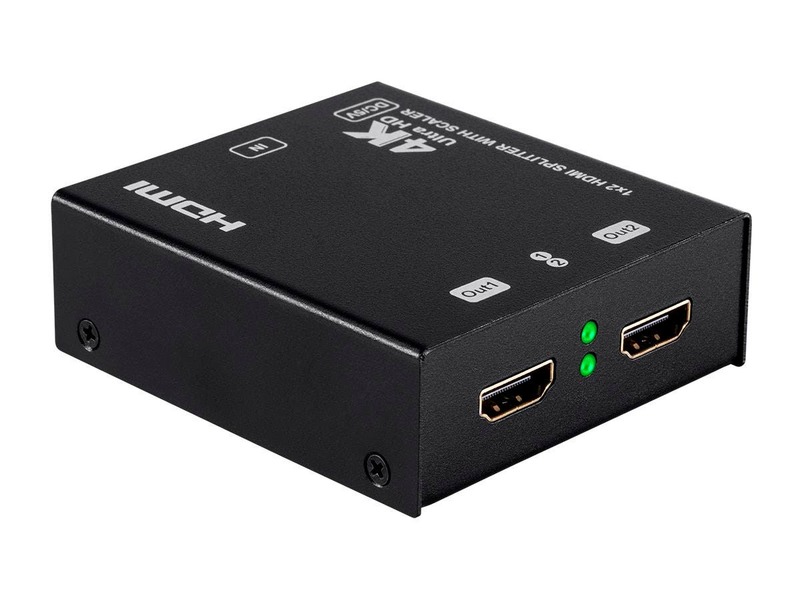 This is the ONE if you want to split your HDMI incoming signal to two devices at the same time without switching problems. The device allows a device to be cut off or on without any interference. Also the audio formats are fully supported for surround modes. Get one especially if your device is 4K and another is 1080p no handshake issues. CONS: Wish the power cord was 15-20 feet for even better placement...really a wish. Length is good for most applications.